Who’s That Cat? 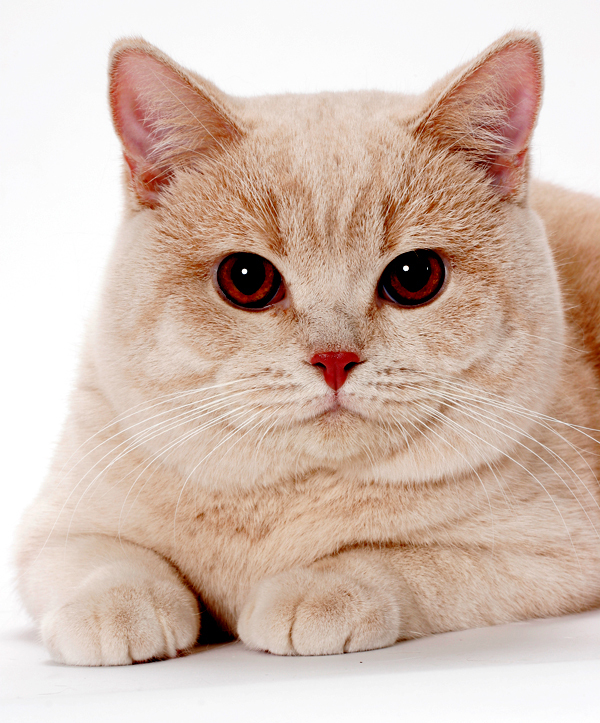 Meet the British Shorthair — Brits Rule! With a large size and dignified demeanor, he has been called the Winston Churchill of cats. Even if you’ve never met one in person, you know the British Shorthair. From the medieval herb woman’s companion to the widely grinning Cheshire Cat of Alice in Wonderland fame, he’s a stalwart of British heritage and literature. Chunky and full-cheeked, the British Shorthair is a comfort cat: just made for sitting in laps, twining around legs as meals are prepared, and majestically stalking a toy mouse — no mad scramble for this famously formal feline. With his large size and dignified demeanor, he is sometimes nicknamed the Winston Churchill of the cat world. He’s best known for his easygoing, affectionate, calm, and quiet nature. True to his British heritage, it takes a lot to ruffle his fur, making him a companion of choice for almost any family. British Shorthairs are calm and prefer to live life with four on the floor. They are unlikely to jump on counters or climb the curtains and have a reputation as something of a klutz. The British Shorthair extends a paw of friendship toward other animals. He typically gets along well with other cats, dogs, rabbits, and birds. The British Shorthair loves lap time, but he’s not fond of being carried around. Children who want to transport him may be better off pushing him in a baby buggy. The adult British Shorthair will snooze the day away while you’re at work, but he likes to be near, next to, or on his people when they’re home. This is a medium- to large-size cat. Males weigh 9 to 17 pounds, with females slightly smaller at 7 to 12 pounds. It’s easy to let this breed become chubby, especially as he enjoys a sedentary lifestyle once past kittenhood, but as with any cat, don’t let him put on excess weight. 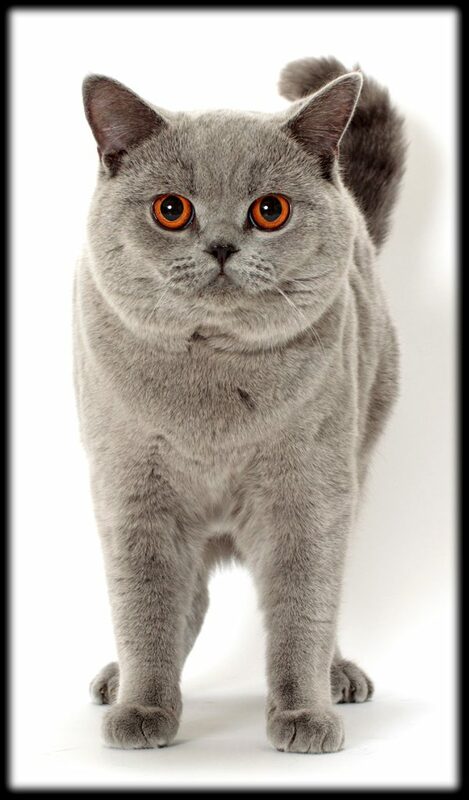 British Shorthairs mature slowly and don’t reach their full size until they are 3 years old. With good care, they can live 14 to 20 years. When it comes to grooming, this breed is low-maintenance. His thick coat doesn’t tangle and is easily cared for with combing or brushing once or twice a week. Like most cats, he sheds, especially during spring and fall. Groom him more often during these times to remove excess hair. 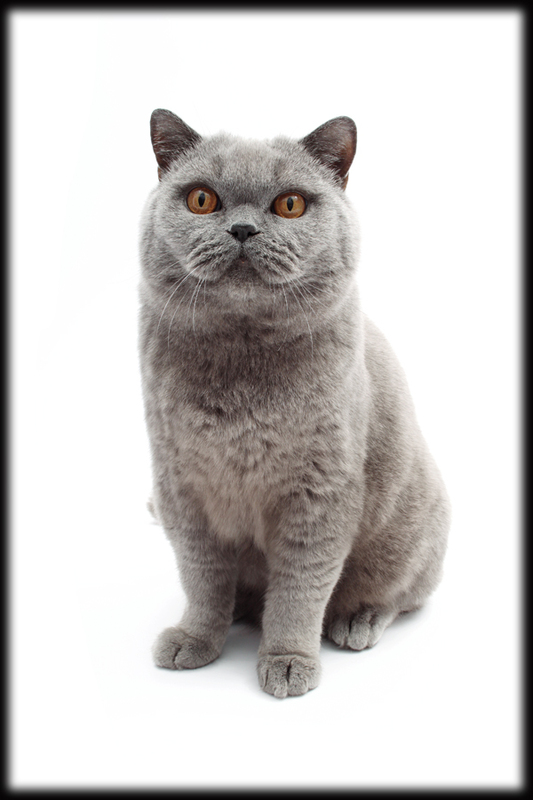 The British Shorthair is generally healthy, but it’s a good idea to ask breeders if the cats in their breeding program have tested free of hypertrophic cardiomyopathy, the most common form of heart disease in cats, as well as polycystic kidney disease. The Romans contributed much to the development of England, including its cats. Armies traveled with them to keep rodents at bay, and the Roman-by-way-of-Egypt cats contributed their genes to England’s feline inhabitants. During the Victorian era, one of the results of the craze for pedigreed animals was the development of Britain’s native cat into what we now know as the British Shorthair. They were among the breeds exhibited at the first cat show in 1871. The Cat Fanciers’ Association recognized the British Shorthair in 1980, and the breed was recognized by The International Cat Association in 1979. The most admired color in this breed is blue, and he is often referred to as the British Blue, even though the cats come in many different colors and patterns, including solid, shaded, smoke, tabby, tortoiseshell, calico, and bi-color. 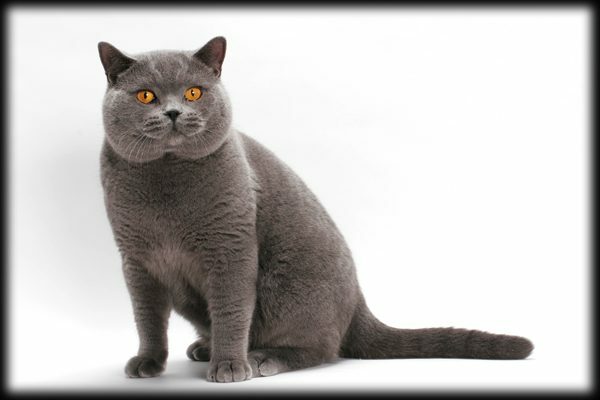 While the British Shorthair is a cat of many colors, shades such as chocolate and lavender or a Himalayan pattern are off the palette because they are evidence that the cat has been crossed with another breed. Depending on his coat color, the British Shorthair’s eyes may be deep sapphire blue, gold, green, blue-green, hazel, or copper. Odd-eyed white cats have one eye of deep sapphire blue and one of gold. The British Shorthair has a compact body and broad chest supported by short, strong legs. Topping it is a round head with a short nose and chubby cheeks. Round eyes with a wide-open gaze look out on the world with stately amusement. A plush coat is his crowning glory. About the author: Kim Campbell Thornton is an award-winning writer in Southern California. Her subjects include pet care, health and behavior, and wildlife and marine life conservation.